Hard red winter wheat in early spring. Residue from last year’s soybean crop is visible in our dryland no-till field. There are various types of wheat, but in the central plains, it’s a safe bet that you’re looking at hard red winter wheat. Wheat is used primarily for human consumption. Ohio State Extension explains that hard red winter wheat is the class of wheat used mostly for bread and all-purpose flour. This wheat is fall-seeded, has medium to high protein content, and can have either hard or soft endosperm. Hard red winter wheat accounts for more than 40% of the U.S. wheat crop and half of U.S. wheat exports. This wheat is produced in the Great Plains, between the Mississippi River and the Rocky Mountains, and from Texas to the Dakotas and Montana. It has a wide range of protein and good milling and bakingqualities.The flour is used to produce bread, rolls, some sweet goods, and all-purpose flour. Total acreage is about 23 million acres. For more wheat facts from the National Association of Wheat Growers, click here. This particular field was planted after soybeans were harvested in late September last year. We feel like September 25th is the magical date for planting wheat in our area, so we aim to get the seed in the ground at least by early October. Planting wheat too early fosters too much fall growth which depletes soil moisture. Planting too late can lead to a thin stand. Both can decrease yield dramatically. 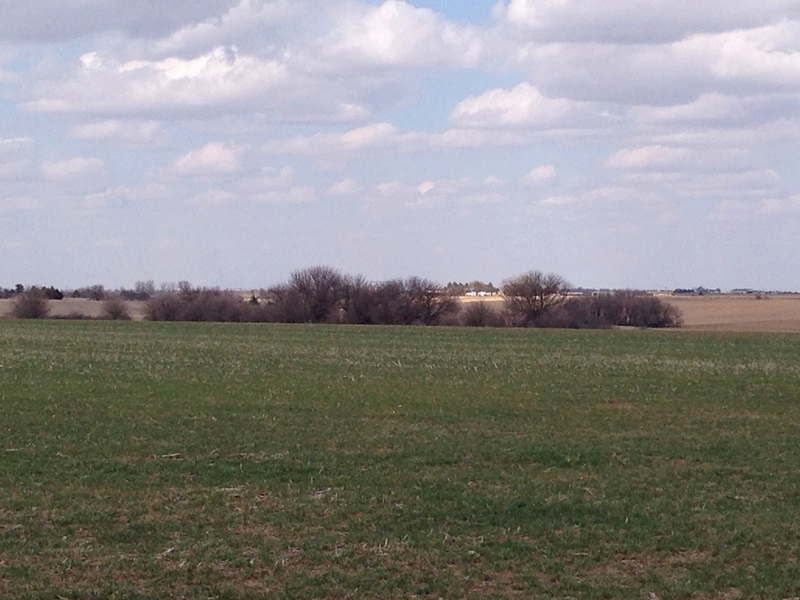 The weather extremes from late fall to early spring can be a cause of concern for wheat farmers. While we all enjoy a stretch of warm days as a reprieve from fury of Old Man Winter, this can have a negative impact on our crop. Prolonged warmth can trigger the wheat to emerge from dormancy too early, and if this is followed by a cold snap, this leaves the wheat susceptible to winter kill. Planting wheat is an important part of the rotation in no-till farming. After the wheat is harvested it leaves behind a substantial stubble, which will be great mulch for next years corn crop. This field has been no-till for over 25 years, so by leaving stalks or stubble from the prior year’s growing season, we’ve done all we can to maintain moisture levels, improve soil fertility, maintain organic matter, and prevent erosion. Although this year will be less profitable for this farm with wheat, next year’s corn should shine because of the value of wheat in the rotation in terms of what ecofallow does for the soil. This field was fertilized with nitrogen in early April, applied by a spray tractor. Wheat responds well to phosphorus in the fall for improved stooling and root development, and nitrogen in the spring for vegetative growth and head size. Fungicide may be necessary to combat disease in upcoming months if needed. I expect wheat harvest in southern Nebraska to begin somewhere between the last week of June and the first two weeks of July. Until then, we’ll pray for good weather. If it’s too dry, the wheat won’t yield well. If it’s too wet, the crop is more susceptible to diseases, like rust, which also take a toll on yield. Storms with wind and hail can also cause extreme damage. It takes some faith to raise wheat. With the wild weather we can have, I have to admit we are a little giddy when a field of wheat turns in a high yield. After the crop is harvested and trucked to the grain elevator, our worries for the growing season are over. However, I do consider where our wheat might go for milling into flour, and the people who enjoy it after that point, as flour or baked goods. It’s fun to think that some of the foods in my pantry could have originated on my family’s farm! When I think of how we grow wheat and that most farmers I know share the same mindset, I’m confident of the process. I’m proud that my family’s farm plays a role in bringing healthy food choices to your local grocery store – and ultimately your table.